With the assistance from the Breaking the Cycle of Poverty and Violence funding, I have been working with the staff of Casa Latina in Louisville because many Latina immigrants come through their doors on a regular basis and they are connected with other groups serving Hispanic immigrants in the city. They also meet weekly with 12 groups of women throughout the city. In a meeting of about 10 Hispanic women I attended, Jeanine, a staff member at Casa Latina handed out two important pieces of information and we discussed the importance of them: 1) The recent announcement by the Administration that those who will be deported are mainly criminals is not a program of amnesty. It is very important that they understand this. We encouraged them to give these three pages to friends and relatives. It is unclear how this change will be implemented. 2) Casa was able to procure from the Presbyterian Church, USA the document of several pages about their rights in case of a raid by Immigration Authorities. We also gave them several pages of important information to have in a safe place in case of a raid and to tell family and friends where to find it. The group had a lively discussion and shared some painful experiences of friends and relatives. A computer has been donated to Casa so we are ordering Rosetta Stone for learning English both for families who live at Casa and for other women who often come there. In time we can set up structured classes. 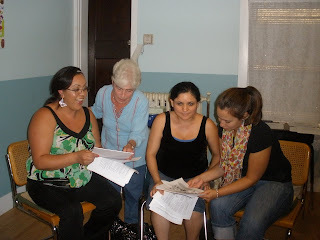 I have been volunteering to teach English to three who live in the house but will assist in structuring a way that others can take advantage of this program. A booklet that combines Know Your Rights educational materials in Spanish and the Community Resource Guide in Spanish has been shared in the groups of women around the city and provided for their friends in order to assure wide distribution.